I want to escape with everyone! In an orphanage isolated from the rest of the world, toddlers to twelve-year-old kids live simple but happy lives. 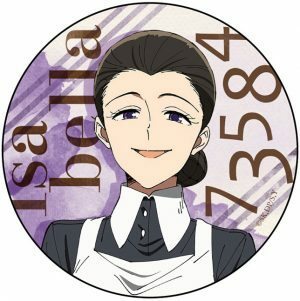 They undertake tough test on a regular basis but get to spend the bulk of their time to their heart’s content under the care of their mama Isabella until they are adopted. When Conny, one of the younger children, is adopted, she just so happens to forget a teddy bunny she cared for deeply. Two of the oldest children, Emma and Norman, try to reach the gate out of the orphanage in time to give her back the bunny only to find her dead, soon to be a feast for monsters. 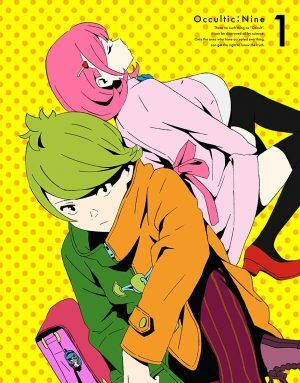 There are plenty of Shounen with three protagonists where one of the secondary protagonists is a girl with a supportive role; Emma subverts that. 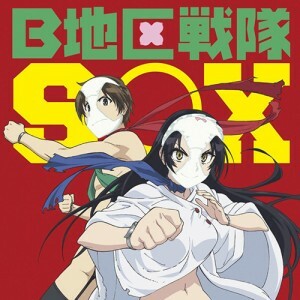 Emma is the athletic one of her trio and the main protagonist. 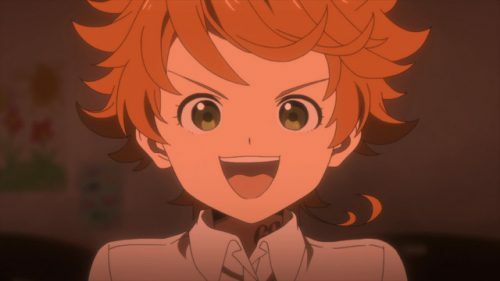 She has the orange spiky hair, faith in friendship, an upbeat personality, and everything else one might typically associate with a Shounen protagonist. 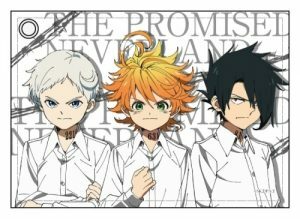 From the start, it’s made clear that Emma is the strong one, capable of greater physical feats than her two closest friends. All that said, she doesn’t lack for intelligence in a Shounen where knowing your enemy can be more vital than being stronger than them. 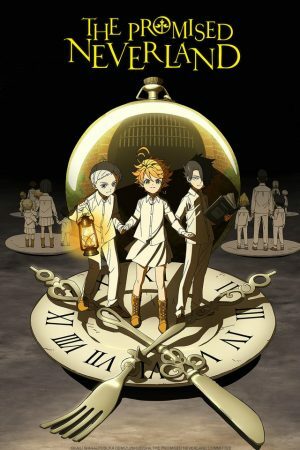 Emma makes a stand that might have frustrated most viewers in the early going of The Promised Neverland: she absolutely will not leave one child behind in their attempt to escape the orphanage. It’s a tough undertaking and most would’ve taken the easy way out of only leaving with the older more capable children, but Emma’s heart of gold prevents her from doing that. 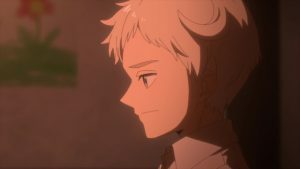 Norman respects her decision and is even more invigorated in their escape because of it but Ray has his own doubts about such a plot succeeding, in fact, it’s hard to tell if he plans on going along with it. It might frustrate us but it’s also why she’s the main hero of this story. After finding out that Ray is a spy for Isabella and that he has long known about their destiny as food for monsters, Emma doesn’t hesitate in forgiving Ray. She trusts in Ray’s claims that he planned on helping her and Norman escape and is sensitive to the burden that must’ve been on his shoulders all those years. The friendship and bond that Emma has built throughout her youth with Ray are too hard to break even with that secret he held dearly, and Emma is eager to forgive him if he doesn’t repeat the same mistake. Despite her forgiveness, Emma warns Ray that he should never allow any other child to die. This is one of the few moments where we can take Emma to her absolute word and we know that if Ray were to betray that trust, there really will be no more forgiveness for him. Emma will not stand for anyone threatening the lives of the other children, even those she hasn’t known for as long as Norman and Ray, they’re all family to her. There might be a tiny desire on our part to see what would happen if someone did hurt one of the other children in front of Emma. 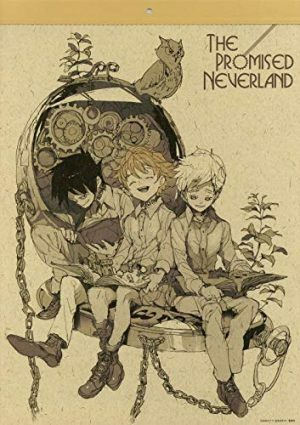 Emma is the heart of The Promised Neverland, a psychological thriller that tends to be more suited for the tactical and strategic Norman and Ray. In a way, she makes it somewhat more challenging for Norman and Ray because of her values. She won’t leave anyone behind, she’s eager to forgive and forget, she prefers not to lie to those who don’t deserve to be lied to, and she has a hard time keeping her emotions in check because she wears her heart on her sleeve. Even so, Emma is the inspiration and the moral compass that keeps every other character straight, and she’s the perfect protagonist for this narrative. 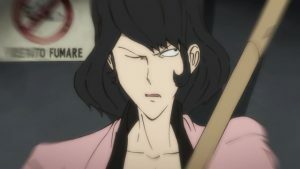 Although Emma fulfills a lot of the standard Shounen protagonist traits, they are tuned perfectly enough to make her one of the best protagonists of the genre yet. She still has very firm values about friendship and loyalty, but we also see where those lines end. She’s incredibly ambitious but her more humble goal of finding a home for her family makes her an easier character to support and stand behind than others with vaguer and somewhat unrelatable goals. As with Norman, we stand strongly in support of Emma and her quest to escape the orphanage and certain doom.